Otogenic lateral sinus thrombosis is a well-known intracranial complication of otitis media. It occurs in combination with other intracranial complications. Before the advent of antibiotics, which brought about a decline in this condition, most lateral sinus thrombosis was attributable to acute otitis media. Now, however, chronic otitis media predominates in most published reports. An image depicting otogenic lateral sinus thrombosis can be seen below. MR venogram that shows nonfilling of the lateral sinus on the left side. Lateral sinus thrombosis was first described in 1826. Three decades later, the pathology of lateral sinus thrombosis was first described by Lebert. In 1888, Lane performed the first successful surgery for lateral sinus thrombosis. Lateral sinus thrombosis is a potentially fatal condition in which early diagnosis may be difficult because of previous antibiotic therapy. In the antibiotic era, the presentation of lateral sinus thrombosis has changed from pronounced signs and symptoms to vague and nonspecific symptoms. The decreased incidence and change in presentation requires clinicians to maintain a high index of suspicion to make the diagnosis. Lateral sinus thrombosis should be suspected in patients who have persistent fever, otorrhea, and headache despite adequate antibiotic treatment. Lateral sinus thrombosis accounts for 6% of all intracranial complications in the era of antibiotic treatment of suppurative ear disease. The proximity of the middle ear and mastoid air cells to the dural venous sinuses predisposes them to thrombosis and thrombophlebitis secondary to infection and inflammation in the middle ear and mastoid. Lateral sinus thrombosis usually develops as a complication of chronic otitis media caused by the direct dissemination of the infection through the neighboring eroded bone. It has been reported in a patient with an intact sigmoid plate, indicating propagation by the thrombophlebitic spread through the small emissary vein. It may also develop as a complication of acute suppurative otitis media by thrombophlebitic dissemination through the emissary vein in the intact bone. Lateral sinus thrombosis was ranked second to meningitis in the preantibiotic era as the most frequent fatal complication of otitis media and lateral sinus thrombosis occurred largely as a complication of acute otitis media. It is less often a disease of children in association with acute otitis media. More often, it is seen in the adult patient after a long history of chronic ear disease. Initially, a perisinus abscess is formed, and, as the infection penetrates the dura and approach intima, a mural thrombus develops. Damage to the intima of blood vessels, hypercoagulation, and decreased blood flow are contributory factors in the formation of thrombus within the vessels. Damage to the tunica intima is the predominant factor in septic sinus thrombosis because the inflammatory process initiates fibrin formation and aggregation of blood platelets. The thrombogenic properties of bacteria are supposed to accelerate the process. Unless effective treatment is properly instituted, the mural clot grows and necrotizes, forming an intramural abscess. A mural thrombus then develops within the lumen of the sinus, propagates proximally and distally, and may become infected. The lumen of the vessel is eventually occluded by the propagating thrombus, and infected material may be embolized into the systemic circulation, causing septicemia. Clinical features vary according to the stage of the disease. Patients present with headache, fever, and otorrhea. The classic case of lateral sinus thrombosis in the preantibiotic era typically produced a picket fence fever curve, due to the periodic release of hemolytic streptococci from the septic sinus thrombus. With the occlusion of the lumen of the sinus, an interruption of the cortical venous circulation results in headache, papilledema, and increased intracranial pressure. Involvement of the torcular and sagittal sinus can result in otitic hydrocephalus. Tenderness and edema over the mastoid (the Griesinger sign) are highly suggestive of lateral sinus thrombosis and reflex thrombosis of mastoid emissary vein. With the extension of thrombophlebitis into the jugular bulb and internal jugular vein, pain may be present in the neck, particularly on rotation. Internal jugular vein may be palpated in the neck as a tender cord. The 9th, 10th, and 11th cranial nerve may be paralyzed by the presence and pressure of a clot in the jugular bulb (jugular foramen syndrome). Because the right transverse is usually dominant, the symptoms are more likely to occur when this sinus is involved. Recovery depends on the development of collateral circulation or possibly recanalization of the sinus. Because of this, the presence of anastomotic channel is important for recovery. The lateral sinus is formed by the confluence of the superior petrosal sinus and the transverse sinus. The right transverse sinus is usually a continuation of the sagittal sinus, and the left transverse sinus is a continuation of the straight sinus. The lateral, or sigmoid, sinus exits the skull through the jugular foramen to become the internal jugular vein. It is called the lateral sinus because it is encountered laterally in mastoid surgery. Schneider S, Kapelushnik J, Kraus M, El Saied S, Levi I, Kaplan DM. The association between otogenic lateral sinus thrombosis and thrombophilia - A long-term follow-up. Am J Otolaryngol. 2018 May - Jun. 39 (3):299-302. [Medline]. Scorpecci A, Massoud M, Giannantonio S, et al. Otogenic lateral sinus thrombosis in children: proposal of an experience-based treatment flowchart. Eur Arch Otorhinolaryngol. 2018 Aug. 275 (8):1971-7. [Medline]. Au JK, Adam SI, Michaelides EM. Contemporary management of pediatric lateral sinus thrombosis: a twenty year review. Am J Otolaryngol. 2013 Mar-Apr. 34(2):145-50. [Medline]. Bradley DT, Hashisaki GT, Mason JC. 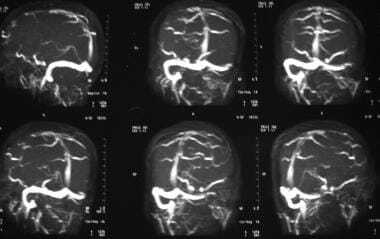 Otogenic sigmoid sinus thrombosis: what is the role of anticoagulation?. Laryngoscope. 2002 Oct. 112(10):1726-9. [Medline]. Levine SC, DeSouza SC. Intracranial complications of otitis media. Glasscock III ME, Gulya CJ. Shambaug's Surgery of the Ear. 5th. Ontario, British Columbia: Deckers Inc; 2003. 443-461. Ryan JT, Pena M, Zalzal GH, Preciado DA. Otogenic lateral sinus thrombosis in children: a review of 7 cases. Ear Nose Throat J. 2016 Mar. 95 (3):108-12. [Medline]. Viswanatha B, Sarojamma MS, Vijayashree D, et al. Unilateral attico antral ear disease with bilateral intracranial complications. Indian J Otolaryn Head Neck Surg. Jan-March 2012. 64:82-6. Samuel J, Fernandes CM. Lateral sinus thrombosis (a review of 45 cases). J Laryngol Otol. 1987 Dec. 101(12):1227-9. [Medline]. Amirmajdi NM. Sigmoid sinus involvement in middle-ear infection. Laryngoscope. 1988 Mar. 98(3):310-2. [Medline]. O'Connell JE. Lateral sinus thrombosis: a problem still with us. J Laryngol Otol. 1990 Dec. 104(12):949-51. [Medline]. Syms MJ, Tsai PD, Holtel MR. Management of lateral sinus thrombosis. Laryngoscope. 1999 Oct. 109(10):1616-20. [Medline]. Ooi EH, Hilton M, Hunter G. Management of lateral sinus thrombosis: update and literature review. J Laryngol Otol. 2003 Dec. 117(12):932-9. [Medline]. B.Viswanatha. Lateral sinus thrombosis: A major problem still with us. Indian Journal of Otolaryngology and Head and Neck Surgery. Jan - Mar 2007. Vol.59,No.1:24-27. Cody.C.C.Jr. Thrombosis of the lateral sinus. Archives of Otolaryngology. 1939. 29:674-680. Lyman.R. The pros and cons of jugular ligation for lateral sinus thrombosis. Kentucky Medical Journal. 1935. 33:351-354. Ropposch T, Nemetz U, Braun EM, Lackner A, Tomazic PV, Walch C. Management of otogenic sigmoid sinus thrombosis. Otol Neurotol. 2011 Sep. 32(7):1120-3. [Medline]. MRI that shows thrombus in the lateral sinus on the left side. MRI that shows postcontrast enhancement of the sinus wall on the left side. The author wishes to thank Professor Khaja Naseeruddin - Joint Director of Medical Education, Professor Kishore Chandra Prasad, Professor B.N. Sambamurthy, and Professor P.P. Devan.